driving the wedge: what peta’s lesser-known tactics can tell us about their work and our own. Trigger warning for racist, fatphobic and anti-immigrant language and images. Perhaps one of the most deceptively simple aspects of organizing for social justice is building an inclusive movement that respects the struggles of multiple communities. It’s similar to building any meaningful relationship. Genuinely share power. Know when to listen, when to support, and when it’s not your role to take the lead. Take accountability for your own actions and privilege, and change your behavior to respect the boundaries of those close to you. Invest in your own growth and the growth of those around you. But that straightforwardness doesn’t make it easy—that’s why so many of us are still learning. Doing this work has made me deeply appreciate organizers and organizations that take accountability gracefully, and that change their approach to reflect the feedback they receive. It’s incredibly moving to see organizing that’s truly borne of love and compassion—enough so to change its course when it leaves communities behind. The flipside of this appreciation is a deep frustration with those that continually dodge accountability, or become more entrenched in their privilege over time. And in my experience, there is no more consistent offender than PETA – People for the Ethical Treatment of Animals. PETA has received consistent criticism for its sexist tactics, which sexualize and objectify women to drive their point home. But PETA doesn’t just throw women under the bus—they target a variety of identities and communities. And ultimately, it hurts their own work. It stymies their ability to build a broader movement, and it alienates potential allies and supporters. And, at its core, it exposes just whose support PETA is trying to win. As with much of what we discuss at You’re Welcome, we’re here to talk tactics, and whether specific organizing reflects anti-oppression values. This post will not debate the merits of veganism, vegetarianism, or the animal rights movement. The discussion below is designed to focus on the tactics utilized by PETA staff and supporters to make their case. And that, as we’ve discussed many times here, is what makes (or breaks) a movement. It’s rare that we at You’re Welcome focus more on what’s going wrong than what we can do right, but I think there’s value in taking a hard look at what our tactics can say about our work, and what PETA’s says about theirs. I hope you agree. Most passers-by seemed more puzzled than offended, though those who didn’t stop walked away thinking they really had seen the KKK. The most common reaction was to pull out a cell phone and start snapping photos. Police monitored the situation from nearby, but the scene was mostly calm. One shouting match broke out during the hour-long protest. Earlier, a man strode away yelling, "That’s disgusting! I’m going to buy more fur!" Invoking images and even the apparent presence of the Klan, an organization founded specifically to disenfranchise and murder people of color, is beyond the pale. But what could PETA possibly be trying to accomplish with these tactics? On its face, this appears to be another attention-grabbing strategy. And it is. As organizers, we know that our communities often want to see us out in the streets, raising a ruckus that reflect the urgency of our work. So we take to the streets at rallies and marches. But most of what we do is a lot less visible. It’s the daily work of building support amongst potential allies, of changing the policies that impact our communities, and of martialing resources to meet our deepest, most basic needs. It’s a lot of time on the phone, in meetings, writing and talking one-on-one with a lot of people who don’t necessarily support us. It’s not the work that’s easy to see, but it’s the work likeliest to make concrete changes in our communities. We often take on higher-visibility work to respect the struggles of those around us by publicly rallying around our shared needs. And we do it to energize our communities for the days, months and years of day-in, day-out tough work ahead, and so that our communities don’t forget that we’re still here, we’re still working. So for PETA to exploit those deep needs and daily struggles to rally their base and garner that attention makes light of all of that work, visible or otherwise. But they don’t just do it for the attention. Like all organizing, these tactics are designed with a specific audience in mind. In this case, the likelihood that any people of color are going to approach anyone in Klan hoods is pretty slim. In fact, the likelihood of engaging anyone who the Klan has historically targeted—people of color, non-Christian people, immigrants, queer and trans people—is largely nonexistent. But PETA’s not looking to engage us. This tactic is designed to engage and build PETA’s base. What this approach demonstrates, regardless of the organization’s intent, is that they want a base that experiences privilege around race, gender, sexual orientation, ethnicity, religion and more. And they seek primarily to engage those who prioritize their own work at the expense of movements that might otherwise be engaged as potential allies. My family was visiting, and I was planning on taking them to the beach to enjoy the beautiful day when i saw a billboard that made me want to cry. 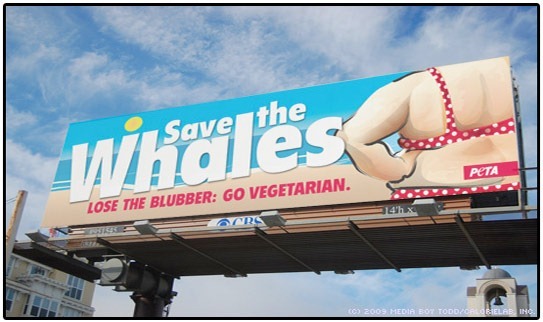 It says “Save the Whales,” with a picture of an overweight woman in the foreground. We all sat there and stared at it for a minute and everyone in the car was silent. No one wanted to mention my weight. I laughed it off as usual, but it really had made me so embarrassed, so self conscious and so ashamed about my weight that I dropped off my family at the oceanfront and left to go home, making the excuse that I wasn’t feeling well. We agree that a world where self-esteem is unrelated to body size would be a wonderful place, but we also know that most people feel depressed and embarrassed about their weight and often need some tough love. Our aim was not to insult people who are overweight but to get people talking—and then persuade them to make a simple, positive change for their health. America’s obesity epidemic calls for tough love à la Dr. Phil and America’s Biggest Loser, not more coddling and mock shock over a billboard pointing out that the majority of fat people need to have some discipline and remember that being fat means being a bad role model to our children, many of whom are now so fat themselves that "teeter-totter" has come to describe their wobbly gait. We’ve unpacked fatphobia at You’re Welcome time and time and time again. What PETA staff are saying here is absolutely, unquestionably fatphobic. As fat people, we have no discipline, we’re bad role models, we’re part of an “epidemic” that we’re somehow also responsible for—hell, we’re the reason children are fat. Won’t someone please think of the children (by bullying them in print)?! Yes, these billboards are fatphobic. They’re also shrewd. They were placed in a city located on the beach in the summer. And they were placed in a state with lots of vacation tourists and a strong representation of fat people. Last year, an estimated 25% of Floridians were categorized as obese. 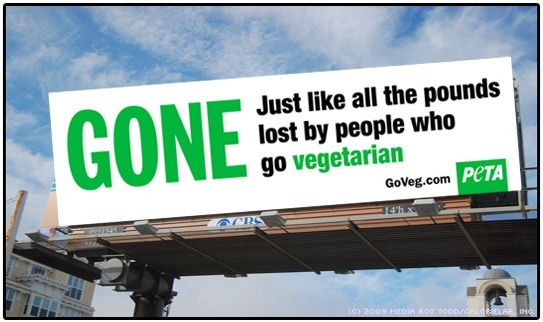 So when they put up these billboards, PETA was presumably prepared to shame and alienate 1 in 4 Floridians. So let’s be real. PETA is not trying to “tough-love” fat people into weight loss with tactics like these. They’ve proven that they are not concerned with stopping body policing. No organization that would use such extraordinarily fatphobic tactics is. Again, these tactics don’t win many new PETA supporters. So who’s left? As with their racist tactics, it seems that this fatphobic approach is designed to keep PETA in the public eye—largely to rally their existing base. With rhetoric like this, they certainly don’t seem to want any fat people around, whether or not we’re losing weight. Immigrant communities have long been targeted by wave after wave of anti-immigrant policies and on-the-ground activity from groups like the Minutemen. This has all been powered by deep-rooted xenophobia, racism, and scapegoating for a variety of social, political and economic ills. You may remember that a few months back the slaughterhouse was busted because "76% of the 968 employees of Agriprocessors were using false or fraudulent Social Security numbers." This was the nation’s largest single-site immigration raid. That’s right, the slaughterhouse was almost entirely staffed by illegal immigrants who were exploited to do the dirty work—such as hacking into the throats of cows who were still conscious. So PETA is playing both sides of the immigration debate—claiming, on the one hand, that “no one should need papers,” and on the other, utilizing inflammatory language like “fraudulent” and “illegal immigrant” to attack their opposition. When combined with PETA’s lack of coalition-building work with immigrant rights groups, it becomes clear that they only care about the political capital of the immigration debate, not about the struggles of immigrant communities. They will shrewdly, cynically play either side of an issue to garner media attention, shore up their own base, and get their point across. To be honest, I’ve struggled in coming up with action steps around PETA’s work. On one hand, PETA has been around since 1981, and has gotten more than 30 years of opportunities to apologize, change their approach, and build meaningful coalitions with organizations in potentially allied movements. They haven’t done any of that—and that could certainly be cause enough to sever ties with the organization, or to begin counter-organizing. On the other, if you feel invested as an animal rights supporter in an aspirational view of what the movement could be, that could investment could translate into more concerted accountability for an organization that doesn’t reflect your values. As I mentioned at the outset of this piece, movements are made up of relationships, and this movement is what you make it. Holding PETA accountable, vocally disengaging from the organization, and counter-organizing can all have impacts here, and all strike me as viable alternatives to simply laughing off their presence or ignoring their actions. Make whatever choice makes sense for you, your community and your work. But whatever choice you make, be sure you’re making it thoughtfully. And, of course, learn from PETA’s mistakes—don’t utilize these divisive tactics in your progressive organizing. It’s easy to tell ourselves that we’d never use such overtly exclusionary tactics, because many of us wouldn’t. But on a smaller scale, many of us make these missteps—often unintentionally—every day. We do it when we say that we deserve rights as “taxpaying citizens,” which implies that undocumented people don’t. We do it when we say that “gay is the new black,” an only slightly less ham-fisted message than PETA’s thirteenth amendment law suit. We are already making these mistakes, and the biggest lesson we can take away is to be as attentive in our approach as we are in setting our goals. Of all these tactics that PETA employs, perhaps the biggest threat they pose is making us falsely certain that we don’t, or can’t, make the same mistakes. Tagged fat, immigration, race, what's wrong with...?